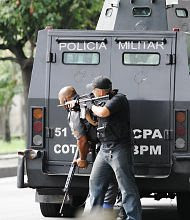 Rio de Janeiro, September 16th, 2009: four people died in a drug-related police operation in the favela called Juramento. Rio de Janeiro, September 18th, 2009: one more person died in another drug-related police operation in the favela called Mangueira. In the news we cannot find the names of the five victims. They were poor people; they lived in slums; maybe they really worked in the illegal drug market. Most people in Brazil do not pay attention to this news. Deaths of favelas' inhabitants during police operations have become a routine. People killed there do not count. They are just the drug dealers; the “bad ones”; or the “enemies." In Brazil, in the city of Rio de Janeiro alone in one year (2008), 2,757 homicides were registered. A report released on September 15th, 2008 by U.N. special envoy on extra-judicial killings, Philip Alston, referring to the year of 2007, showed that Brazilian police murdered three people a day on average in Rio de Janeiro, making them responsible for one in five killings in the city. In fact, at least in the last ten years, 20% of all murders in Rio de Janeiro have been summary executions that happen during police operations against drug dealers in the favelas. This is Brazil's own war on drugs. This is one of the most tragic results of drug prohibition. To put an end to prohibition-related acts of violence in Rio de Janeiro, or in anywhere else, is one of the main reasons to urgently legalize the production, supply and consumption of all drugs. So sad but so predictable: The More There is of Something, The Less Valuable It Becomes, Including People's Value of Other People. Associative logic, a Holier-Than-Thou attitude, and adrenaline rushes, are some people's drugs.